This is not how Rasmus Dahlin envisioned his rookie season ending. The 19-year-old defenseman, along with his Buffalo Sabres teammates, endured a miserable second half that stretched the team's playoff drought to eight seasons, longest in the NHL, and led to the firing of coach Phil Housley. Dahlin was solemn during locker cleanout Monday in KeyBank Center. He declined to comment on Housley's dismissal, echoing his teammates' sentiment that the responsibility should fall on the players. Rather than reflecting on his own accomplishments, Dahlin spoke passionately about the future, specifically how he needs to improve for his second full season in the NHL. "For me, new to the league, a young guy, a rookie, it’s been so much fun for me," Dahlin, who turned 19 years old on Saturday, said. "For me, to come to a new country and all that kind of stuff. I learned so many new things and it’s been amazing. But hockey-wise, we haven’t played how we want to play. We didn’t end up how we wanted to end up, so I want to play better next year and the guys want to play better next year. It’s going to be an important year next year, too." If the past two seasons took a toll on Dahlin, he never showed it. Last year, he represented Sweden at the World Junior Championships and the Winter Olympics in PyeongChang, and played 41 games for Frolunda HC of the Swedish Hockey League. Then came his preparations for the NHL Scouting Combine, getting drafted first overall by the Sabres in June and moving across the globe to prepare for his first season in North America. 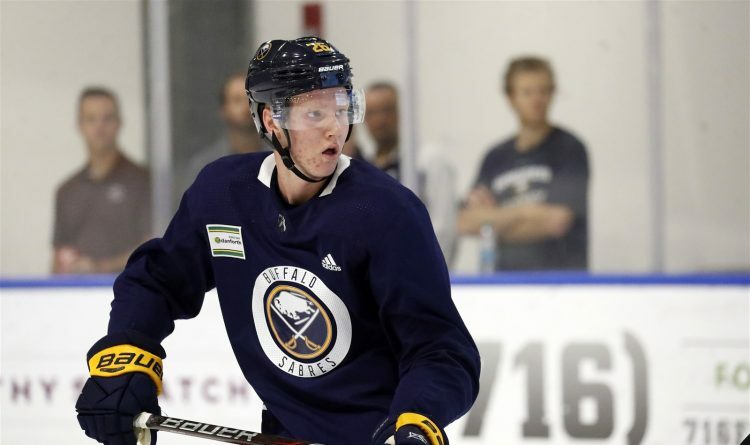 His mother, Asa, stayed in Buffalo for almost two months to help with the transition, but Dahlin mostly leaned on his teammates, including his roommate, fellow rookie Casey Mittelstadt, to learn the culture and better understand English. Dahlin never seemed slowed by the grind of the NHL schedule or opponents' concerted effort to check him at every opportunity. He joined Sam Reinhart and Jeff Skinner as the only Sabres to play all 82 games, a remarkable accomplishment for a player not accustomed to the league's physicality. 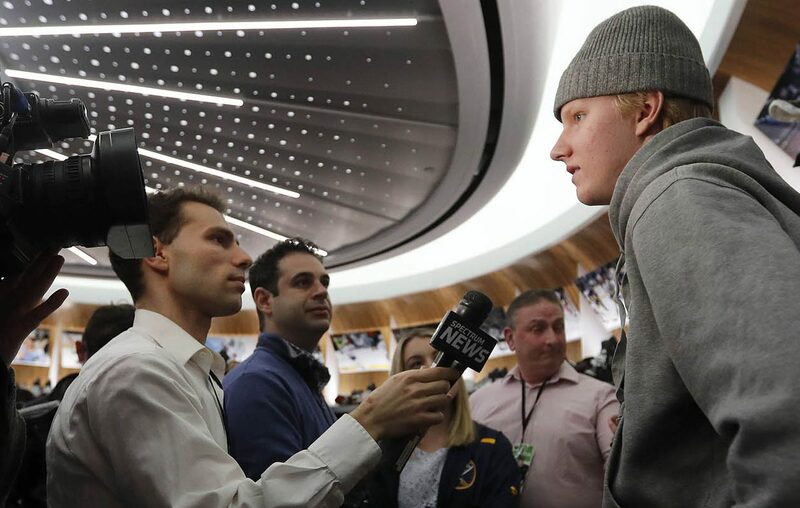 Though Dahlin was flattered to be mentioned among the elite players, he made it clear to reporters, either in Buffalo or on the road, throughout the season that all he cared about was winning. And there were many individual milestones. Dahlin led all rookie defensemen with 44 points and ranked third among all rookies, trailing Vancouver's Elias Pettersson and Ottawa's Brady Tkachuk. That is the second-most points recorded by an NHL defenseman before his 19th birthday, surpassing Hall of Famer Bobby Orr and trailing only Housley's 57 points with the Sabres in 1982-83. Dahlin had nine goals, 20 power-play points and a minus-13 rating on a team that posted a negative-50 goal differential. "I like his game a lot," ESPN analyst Barry Melrose, a former NHL defenseman and coach, told The Buffalo News. "He plays against the other team's best players. He's a great skater, which we knew he was. I thought he was great. I know everyone looks at Pettersson having a great year, but you can't judge a defenseman the same as a forward. If you make a mistake as a defenseman, it's in your net. "He's a blue-chip defenseman. He'll be back there for a lot of years for Buffalo and they'll be building their defense around him." Additionally, Dahlin's five-game point streak in January matched the longest by any 18-year-old defenseman in NHL history and his eight multi-point games were tied with Orr for second. He ranked second among all rookies with 21 minutes, 9 seconds of ice time per game, and his role grew throughout the season. Dahlin was the quarterback of the Sabres' top power play and improved their performance at even strength. The team had a 51.9 percent 5-on-5 differential with Dahlin on the ice, which trailed only Skinner among qualifying Sabres. Dahlin wore his emotions on many nights following the Sabres' 10-game winning streak. He snapped his stick and slammed the bench door. Dahlin finds losing unacceptable, so much so that his frustrations following a preseason loss led teammates to warn him of how to balance those emotions. "He’s just an amazing kid," Sabres goalie Carter Hutton said. "Granted all the accolades and his on-ice [accomplishments], but I think for me the biggest thing I’ll take away is how good of a kid he is. He’s a really good teammate, a really good person, he works hard. He respects everybody, he wants to get better, no entitlement. He’s just a great kid all around and honestly, I think the future is so bright for him, especially with the way that he handles himself on and off the ice." Dahlin's season was far from mistake-free. His fearlessness with the puck led to poor turnovers in his own zone and he struggled with defensive coverage in Housley's system, though he was not alone with the latter. Still, Dahlin would be assertive with the puck, and as the season progressed, he added a physical element to his game and never shied from contact. His daring breakout passes sprung the Sabres for odd-man rushes, and he often carried the puck out of his zone with ease, even with an opponent in pursuit. "I want to play like a leader," he said. "I want to play good in the D zone, play good in both ends, so I’m trying to focus more on how I play, not the points. Hopefully I can get better this year." Most impressive, he could dictate the pace of play with the puck on the blade of his stick. Injuries and performance caused Housley to use Dahlin with a number of different defensive partners, and Dahlin was even asked to play on the right side. His performance during the season's first half caused New York Islanders coach Barry Trotz to compare Dahlin to Hall of Fame defenseman Nicklas Lidstrom, a four-time Stanley Cup champion and seven-time Norris Trophy winner. "The National Hockey League and North American ice surface is a lot different than the international ice surface in terms of forechecking and how much room you have on the ice," Sabres television analyst Martin Biron said in a phone interview. "That combined with the speed of the NHL, you saw Dahlin at times making rushed plays and making mistakes. But he would do the same play 10, 12 minutes or a period later or game later and learned from it. That’s what was most impressive with him." Dahlin will surely be among the finalists for the Calder Trophy as rookie of the year, though Pettersson is the favorite after scoring 28 goals among 66 points. It is also unclear if Dahlin will compete for Sweden in next month's World Championships. Once his offseason training begins, Dahlin will be focused on strength. He wants to be better prepared to clear opponents from in front of his own net and put more zip on his left-handed shot. He made remarkable progress on the latter throughout the season, as illustrated by his precise wrist shot for a power-play goal in the Sabres' season-ending win in Detroit. On a dismal day for the franchise, General Manager Jason Botterill addressed reporters during a news conference following Housley's firing and expressed optimism for the future. He took responsibility for a roster that lacked depth scoring but noted the steps taken by young players, including Jack Eichel. Dahlin is now part of the Sabres' foundation. When some of his teammates were talking about accountability during locker cleanout, Dahlin spoke passionately about bringing playoff hockey to Buffalo. "I came here to want to make a change here," he said. "Like what I’ve heard, we have made a small, small difference here, but we want to be a winning team. We want to make the playoffs every year so I’m here to make the change. I’m super-excited for next year. "Somehow, we’re going to turn this around."